When temps reach -40° outside the aircraft, you need an accurate and reliable heat source. Our line of certified Electrical Heater Controllers (EHC) are designed to precisely regulate temperature control functions for electrical heating units used throughout the aircraft ensuring the comfort of passengers and crew. The EHC is used to control and monitor electrical power to the heaters which often provide supplemental heat to the aircraft or to control the temperature of small compartments. 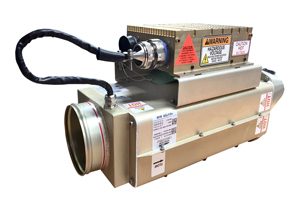 Our EHC's are carefully designed to detect overheat and power fault conditions and have the ability to shut down power to electrical heaters, minimizing potentially dangerous conditions on the jet or helicopter. In addition, our EHC's directly interface with the heater unit and provide power system diagnostics and prognostics, which can alert the operator to upcoming required maintenance actions, eliminating expensive last-minute repairs. AMETEK PDS Electrical Heater Controllers are available in multi-channel (12 heaters) and single channel rated up to 6 KW certified for both 115VAC, 230VAC, wild frequency applications and are currently in service around the globe on all types of aircraft. Contact us for more information or to schedule a demo today!